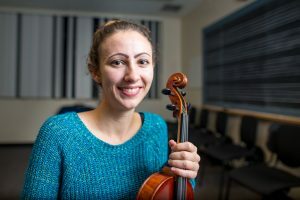 Jacinda Stahly is a newly graduated violin performance major, and among her options for what’s next is pursuing a master’s degree in performance. Yet she prefers behind-the-scenes work over “being out front,” she said. That may sound paradoxical, but at Eastern Mennonite University the Alabama-raised teacher’s daughter was able to tailor that performance degree to fit her own goals and personality. Stahly said she was particularly connected to two communities at EMU. One was the student newspaper The Weather Vane, where she worked as a copy editor for two years and then as a co-editor for another. She found herself at home there in more behind-the-scenes editing roles. Recent graduate Jacinda Stahly poses with her violin. “A success story for our department,” says Professor Joan Griffing. Stahly has been both an arts administrator and violin section intern for three summers with the internationally-renowned Shenandoah Valley Bach Festival, and is continuing with administration as the program assistant for EMU’s Preparatory Music Program. 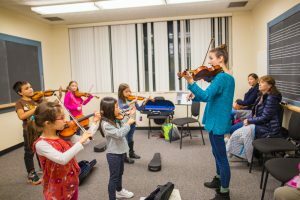 There she also teaches lessons to a small group as well as to five individual students, and is an assistant teacher of violin classes with 20-40 students at each of three elementary schools. 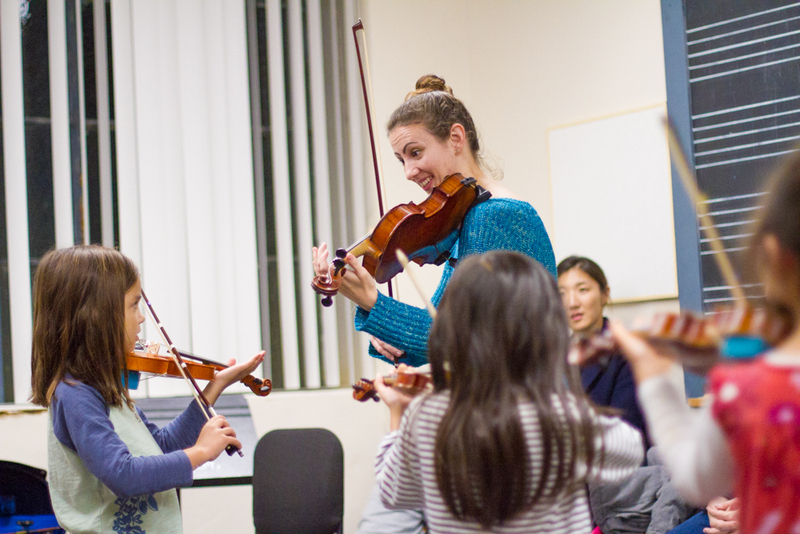 Jacinda Stahly teaches a violin class in EMU’s Preparatory Music Program. It’s perhaps in small-group and individual teaching that Stahly is finding the perfect blend of performance and behind-the-scenes work. As a first-year student, she took a Suzuki pedagogy class taught by Professor Sharon Miller, the administrative director of the Shenandoah Valley Preparatory Music Program. Before coming to EMU, the Suzuki method of violin instruction was peripheral to Stahly’s experience; in retrospect, she thinks she would have benefited from its emphasis on ear training and listening. Stahly’s personal growth during her four years at EMU was cultivated both within the close-knit music department and more broadly. Her cross-cultural trip to central Europe was her first time out of the United States, and gave her new perspective. She was surprised, particularly in Austria, by the informed interest in and deep concern about the 2016 elections in the United States – and the reluctance of many Austrians to talk about their own similar political polarization. In Europe she also developed a new sense of independence. Until that trip, Harrisonburg had been the biggest city that Stahly had ever lived in. In Prague, London and Vienna, the world felt “much more open,” she said, adding that she particularly enjoyed the opportunity to live and travel independently within these cities. At EMU her faith journey, too, continued, building on the foundation formed by her “supportive and loving” community at home.